A storm passed through southern Illinois earlier this morning. I sat at the computer, beside the picture window, working on blog. I looked out, and there was a box turtle crossing our yard. I grabbed my camera and out I went. At least turtles are slow and more cooperative for pictures. 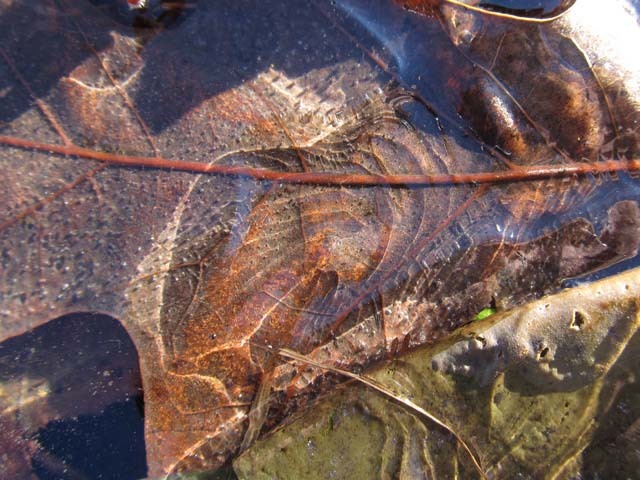 You can tell the approximate age of a box turtle by counting the rings on plastron (a plate). I counted thirteen rings on one of the plates. Male box turtles have red eyes and the females have brown. I sat at the computer working on the blogs from the earlier yard visitors. Then what do I see next — a young squirrel. Squirrels aren’t common in our yard. 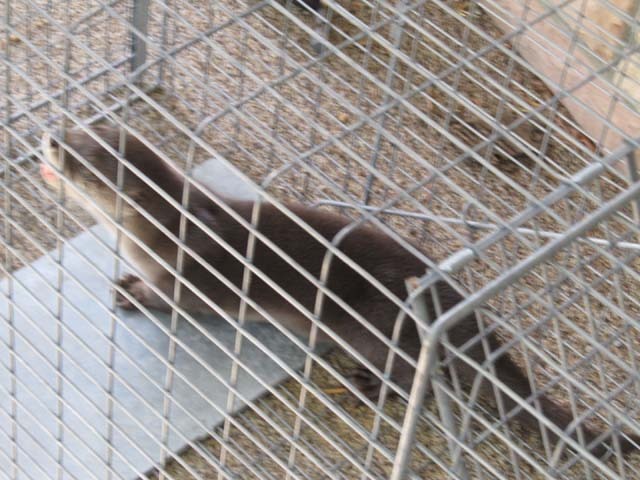 This one was a fast little critter that didn’t pose for pictures. I lucked out getting these two. 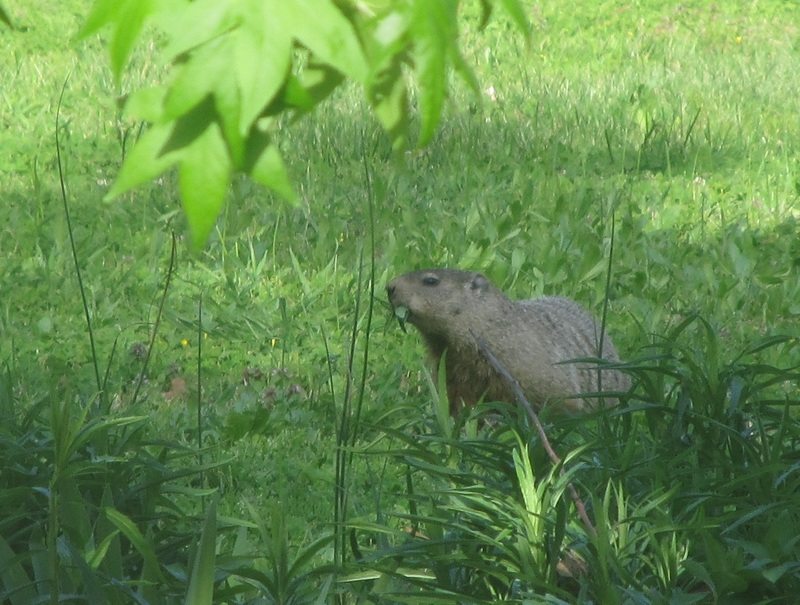 Our yard seems more popular with the mammals this summer than usual. 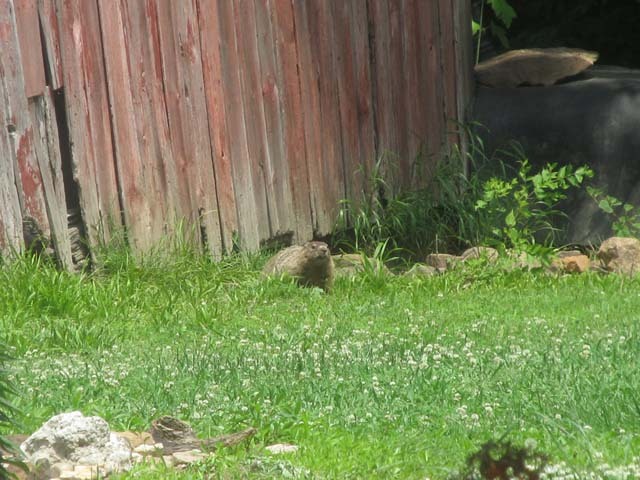 The groundhog claims the area under the barn (where the foxes had been). 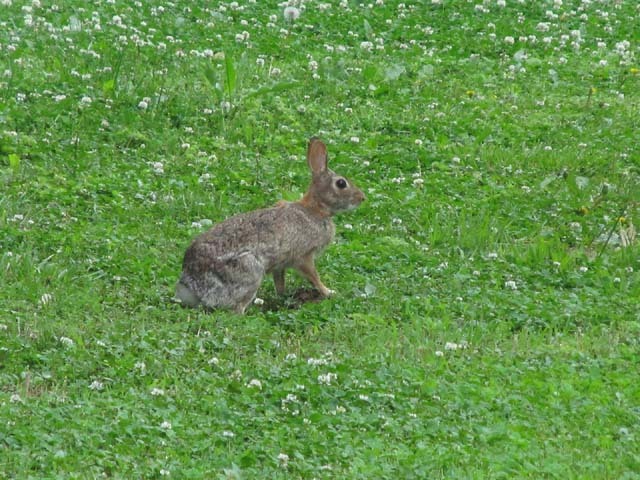 The rabbits are more common and can be quite playful. 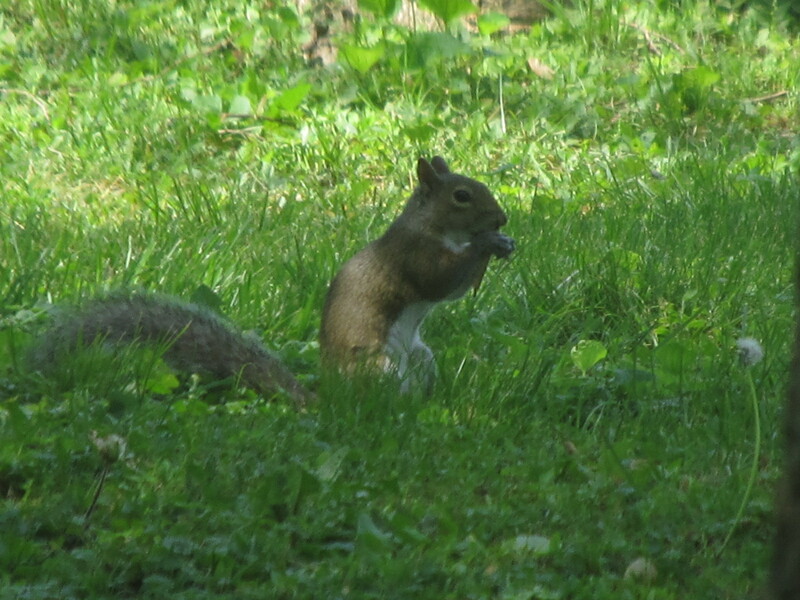 A squirrel ended up eating its lunch in the front yard, while I ate mine by the living room window. 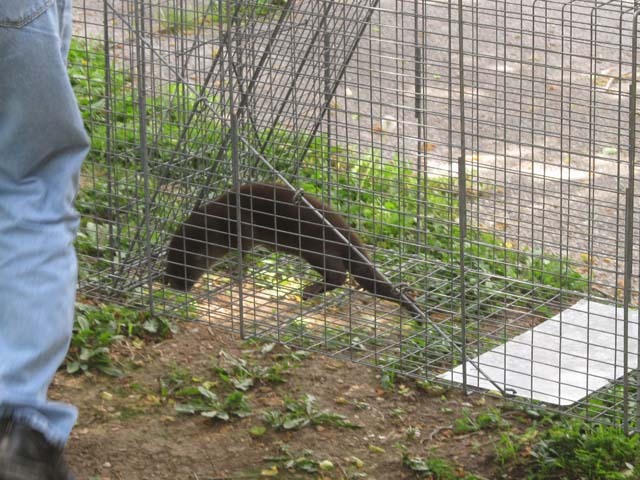 Last week was a busy week for mammals in our yard. 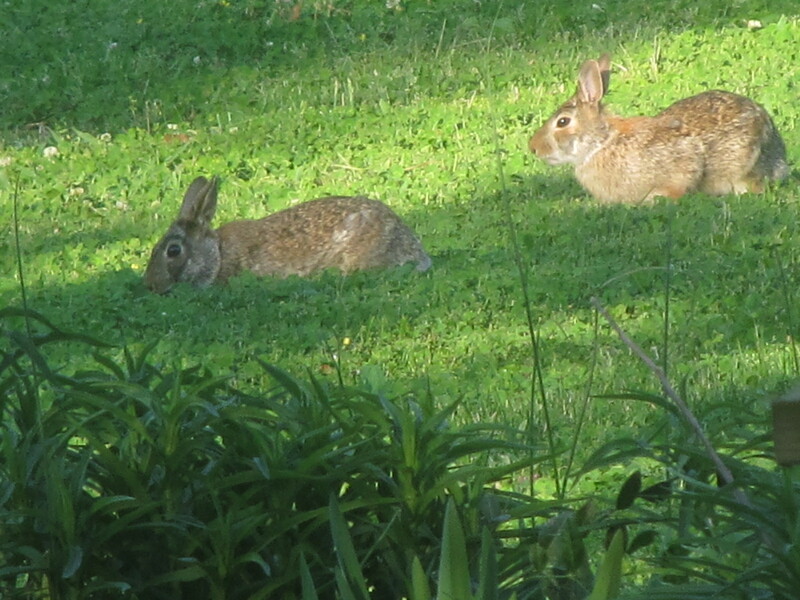 Young rabbits seemed to eat often. The groundhog still thought the barn was for her and her one young. 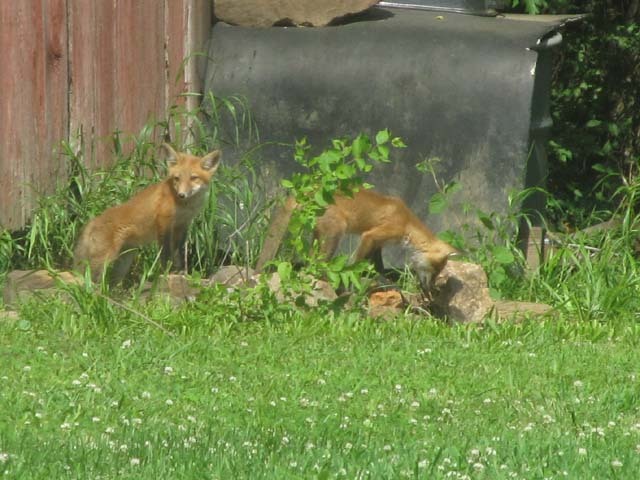 Foxes moved in and considered the barn theirs. The groundhogs took the north side and the foxes the south. They all left after two days of that. A young squirrel walked out into the back back of our yard. It was too far for a picture. It got exciting around here. I opened the front door and heard the “huffing” sound of a mad or injured animal. I couldn’t see it because it was in the narrow space between the two steps and the side of the house. The ferocious sounds convinced me to stay in and keep Buffy in. The angle wasn’t right to see anything from the kitchen window. 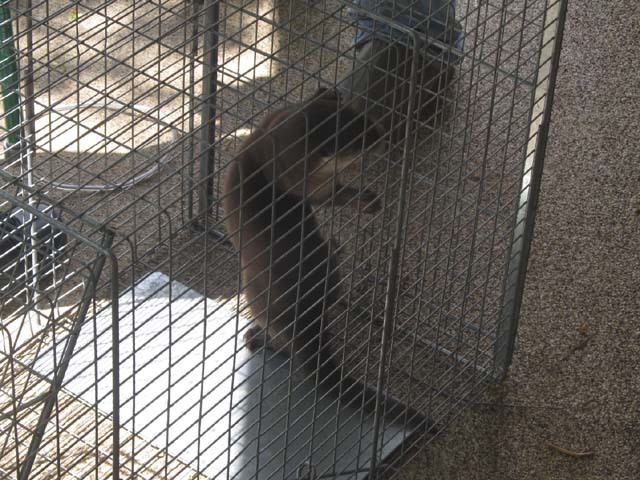 My husband got home, checked the critter. I called the sheriff department, who called animal control, who came out immediately. He and my husband got it into a cage. A young otter! It was MAD! I got a good look at its mouth full of sharp pointed teeth. That and its vicious noises and attitude, convinced me to keep the storm door between me and it, even though it was caged. It could have squeezed through one side of the door where it was bent. That definitely added excitement to our afternoon! The sky cleared this morning, and light rain and snow are expected later this evening. The thought “yard walk-about” had me heading out the door. 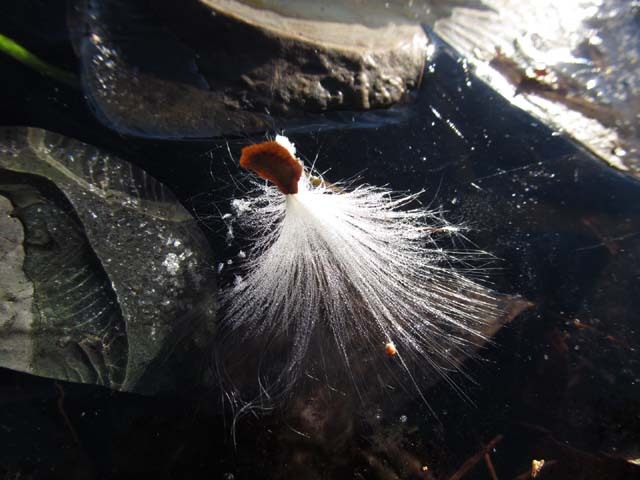 This milkweed seed obviously stood out where it was stuck to the ice in the water garden. I knew it wasn’t from the butterflyweed that grows in my butterfly garden. They released their seeds months ago. 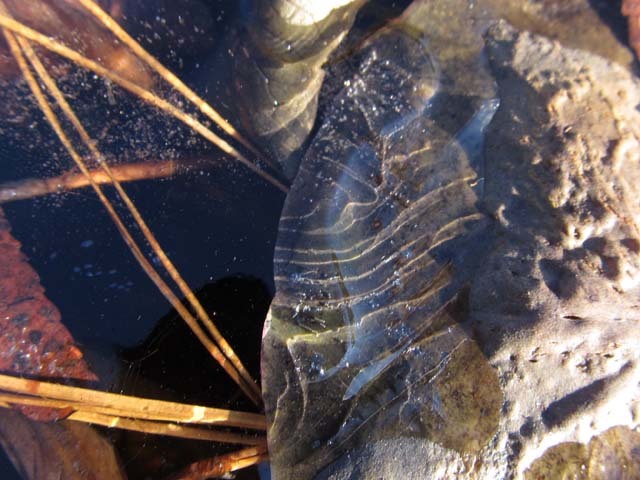 Ripples in the ice created interesting shadow designs. 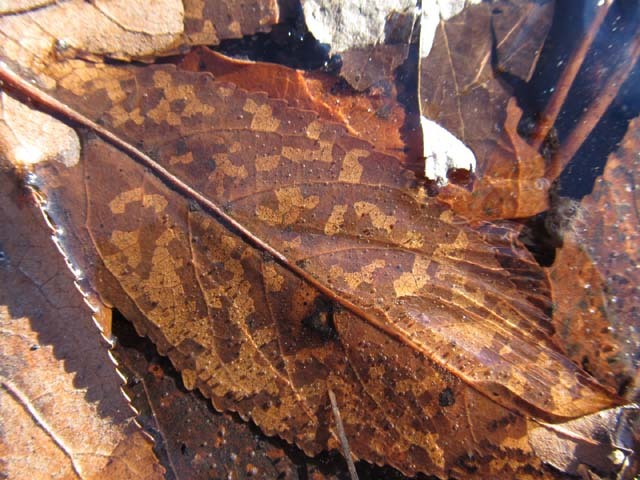 Feeding immature leaf miners left designs on this leaf. 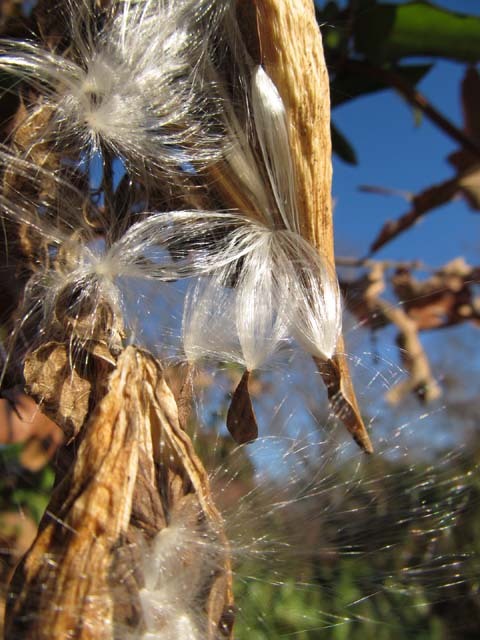 This climbing milkweed (Amplelamus albidus) is considered a pest. Monarch butterflies will occasionally nectar on its small white flowers, and will lay eggs on the leaves late in the season. 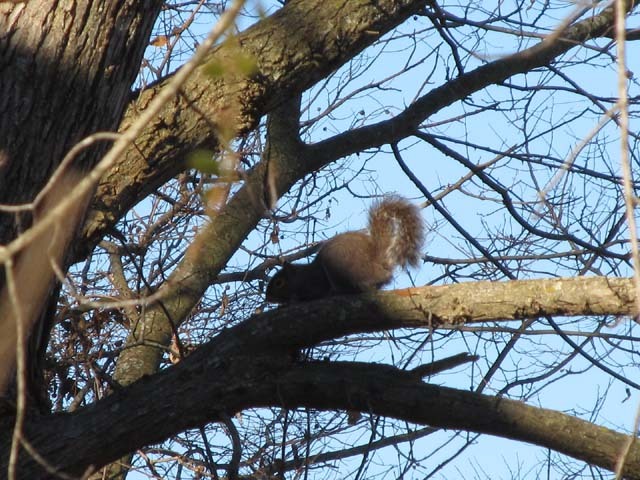 Squirrels occasionally visit our yard. 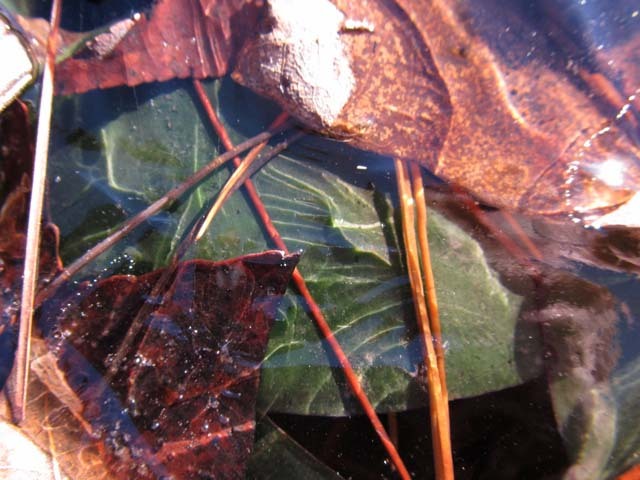 It stayed frozen on the limb of the elm tree, and hurried toward the trunk when I started walking. I might just have to do another yard walk-about this afternoon too. If I remember right, there’s a law against doing housework on New Year’s Day.